FlowWorks makes Operations and Asset Management Easier for City of Kimberley. In October 2013 the City of Kimberley implemented FlowWorks to monitor the operation of their water systems. The city had made significant investments in monitoring instrumentation for their water and wastewater systems and was seeking a data management solution. After viewing the FlowWorks system at a local conference the decision to implement FlowWorks came through a water loss management planning project supported by the Columbia Basin Trust. The project identified the need to provide leakage control flow monitoring as well as solve the city’s need to monitor and alarm other processes at their facilities. Prior to implementing FlowWorks, data was collected manually and alarm notifications were done through a third party auto-dialer system. The city had previously investigated SCADA but found the staggering cost could not be justified. FlowWorks was installed at a fraction of the cost of SCADA and the City of Kimberley was able to control monthly expenses through FlowWorks low cost subscription based solution. Chris Mummery, the City of Kimberley Utilities Supervisor, stated how useful FlowWorks’ data processing tools are for making informed decisions. “With FlowWorks, we know what`s actually going on in the field. Operations staff and management alike utilize FlowWorks on a daily basis. The first thing I do in the morning after checking my emails is to go to FlowWorks and track trends. 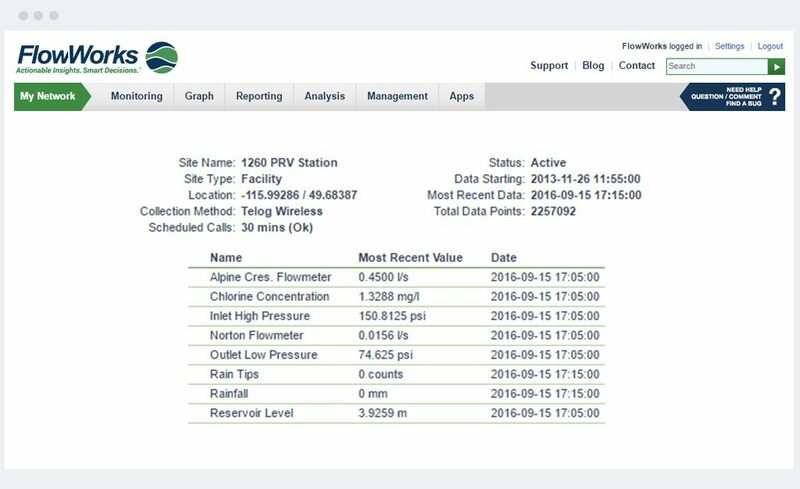 We have been able to pick up on leaks and issues at PRV stations much, much faster than in the past.” The City no longer needs to manually record compliance monitoring data and performance reporting is much easier, freeing up time for both operations and management personnel. The City of Kimberley has expressed its intentions to expand their use of FlowWorks to include all of their water and wastewater sites, along with weather stations and temperature sensors on the road to the Kimberley Alpine Resort.